So it's like this...ever since i signed a peace treaty with yeast (read fresh yeast-dry yeast is yet to be conquered) ans learned to make my own bread, i have NEVER bought any bread from the bakery or the supermarket again. Did i hear a roar of applause?? Thank you! Thank you! i humbly take my bow...eh! I cannot emphasize enough, the sheer joy of making ones own loaf of bread or buns. It is truly therapeutic (for me), i mean...like... if i am frustrated battling my 2 year old..i make bread. Husband is too distracted watching television and go, "umm? aha? umm..", even when you have finished vending out your frustration dealing with inefficient help-at-hand (can you beat the irony?) sigh!- make that bread. I know i am crazy, but when i take out my frustration on the dough...magic happens - it makes for a good bread. Somehow the creation and recreation of this beauty makes me smile and forget all my frustration in life. Is life treating you unfairly??? Let's make a loaf of bread or maybe a basket of buns...it is and will be an exhilarating experience. Let's get yeasty-dirty. This is the second time i am making these buns. The first time was during the passion week, i made it exactly like the original recipe with raisins and various spices, this basket full of buns was from then. We all loved it so much so i decided to make it again yesterday, but this time i kept it plain and this morning it is over (i made around 20 buns), just a testament of how much this family is such a baddy-bready family :). The recipe is adapted from pioneer woman, she is one gorgeous and wacky person that needs no introduction in the world of food blogging. I love her and love all those diet-killing food she dishes up at her site. As you go about making these buns, you'll realize that it is such a bindaz-fuss-free recipe. I made it with the raisins and spices for the passion week baking but made it plain for this post, either ways it is one easy and absolutely lovely recipe. Do give it a shot if you are reading this :). To proof the yeast, heat about 1/4 Cup of milk for 10 minutes in the microwave, add about a teaspoon of honey and add the fresh yeast. Stir to mix and leave it aside to froth. Sieve 3 cups of flour and salt in a bowl. In a separate bowl sieve the 1/2 cup flour, baking powder and baking soda and keep aside. Warm the remaining milk for 10-20 minutes in the microwave, add sugar and stir to dissolve sugar, add the oil and stir to combine. 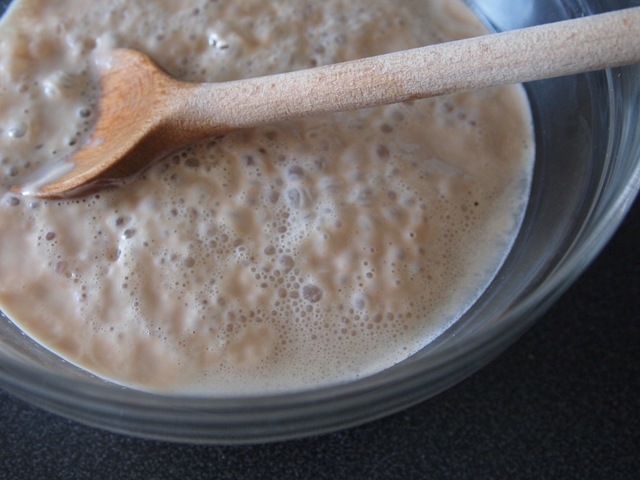 Pour the yeast as well as the milk and oil mixture over the flour and salt mixture and combine using a wooden spoon. It will be a sticky dough. Once properly combined, cover the bowl with a lid or kitchen towel and allow it to rise or double in size ( about 30 mins to 1 hour). Once doubled in size add the remaining flour mixture to the bun dough and use your hand to combine. Grease around 3 cookie sheets or steel plates, like me :) and keep aside. Now pull off dough, the size of a golf ball or bigger and roll into a ball and arrange it on the prepared tray until all the dough is used up. Cover the dough crowded trays with a long clean towel or individual towels and allow the rise or doubling in size to happen again (20-30 mins). Preheat your oven at 180C. Whisk the egg white and milk till combined for the glazing phase:). Once the buns double in size, brush each buns with the egg-wash using a pastry brush and bake it in the preheated oven for 14-15 minutes. Let cool for a bit and then attack the yummies :). Simply simple right! Now just imagine if everything in life was this easy and nice and sweet? ummmm.. Let it rain buns in your kitchen this weekend...Cheers to a great weekend!